Many people today rely on computers or smartphones to get their work done more efficiently. While it’s true that these devices make our lives easier in many ways, using them for an extended period of time can affect your health, especially your eyesight. Digital eye strain is the most common side effect of prolonged computer or screen use. 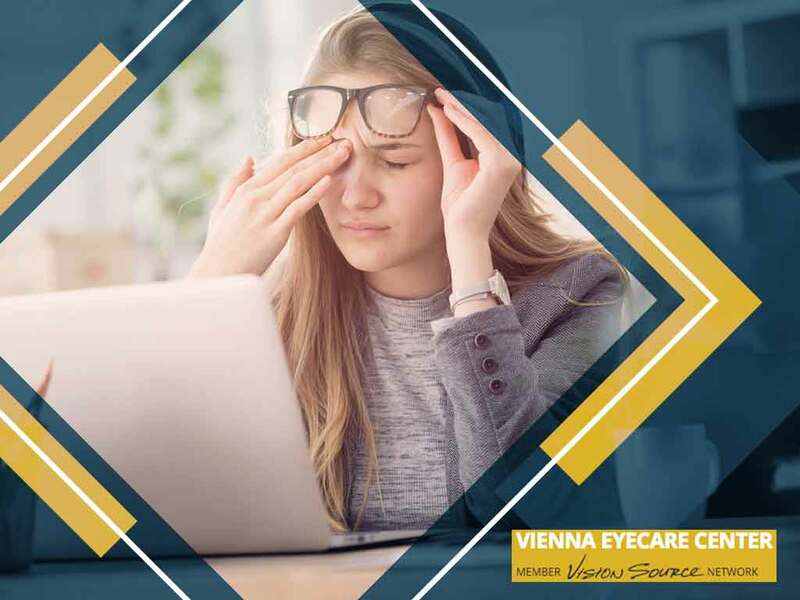 Your eye doctor from Vienna Eyecare Center discusses how to avoid eye fatigue when using your computer or mobile phone. Digital eye strain may be due to the excessively bright light passing through your windows or cast by harsh interior lighting. Install window drapes, shades or blinds to control exterior light, and avoid placing your computer in front of your windows. You should also consider reducing the intensity of the light bulbs and tubes in your office. Reflections from your computer screen and the glare off of walls and finished surfaces can also cause eye fatigue. Invest in an anti-glare screen for your monitor, and if possible, paint the walls with a darker matte finish. Your optometrist may also suggest using eyeglasses with anti-reflective coating to reduce glare. Adjust the computer display setting of your device, including brightness, text size, contrast and tint. This can help enhance eye comfort when using your computer over a lengthy time period. Follow the 20-20-20 rule when using your computer. This rule suggests looking away from your computer screen every 20 minutes to gaze at an object that’s 20 feet away for 20 seconds. With this exercise, the focusing muscles of your eyes are able to relax, reducing eye strain. Count on Vienna EyeCare Center for the health and care of your eyes. We provide various eyewear, including prescription eyeglasses and contact lenses, to correct and maintain clear vision. Call us today at (703) 688-7003 or fill out our online form to schedule an appointment. We serve residents of Vienna, McLean, and Reston, VA.